Siberian cedar or pine Siberian cedar is by far the king of all the trees of the taiga zone. This is a powerful and majestic tree, even in fairy tales appeared in the form of an old man, a sage. 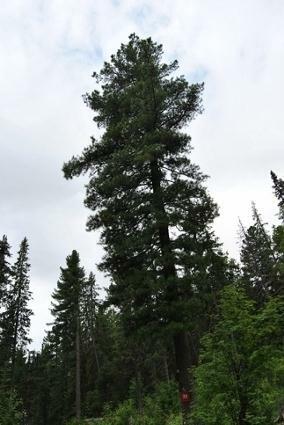 It is understandable, cedar pines reach at times majestic shapes and sizes, and against neighboring spruces and firs seem to be giants. With the huge paws - powerful branches and crowns. 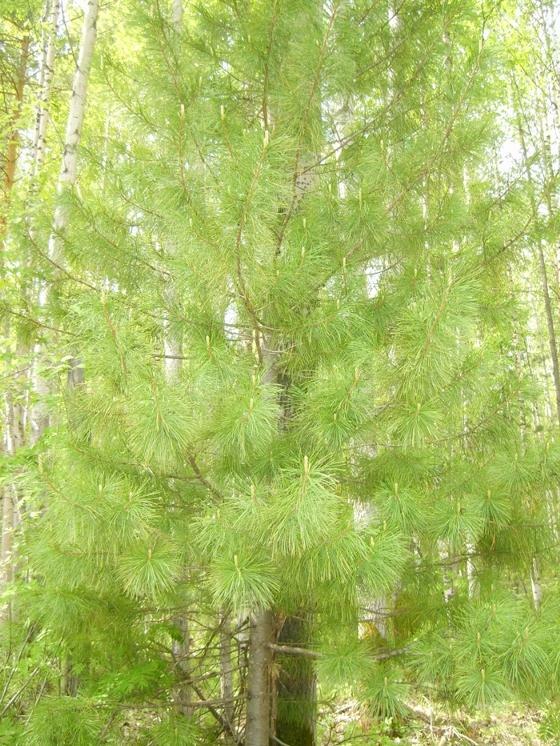 For its size is second only to another coniferous relative - sequoia. 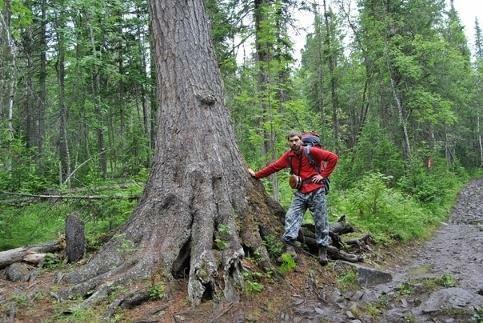 Cedar reaches a height of 45 meters and live for 800 years, at times, and even more. The diameter of the trunk is up to 2 meters. In their view the cedar is a cross between a spruce and pine. Sometimes it can be confused as to the spruce and pine with. It has long soft needles, which is difficult to prick. Cedar resin has a pleasant aromatic odor and is widely used in folk medicine. 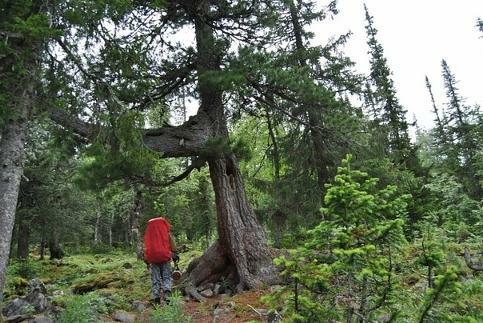 Siberian cedar is king of the taiga and because it is a valuable commercial object, as well as forage grounds for many boreal birds and animals. Cedar nuts are very nutritious and contain a large amount nutrients the body needs, as animal and human. In particular, essential amino acids, vitamins and minerals. What makes them valuable food product, recommended by many nutritionists. As can be seen on the diagram, the area of ? 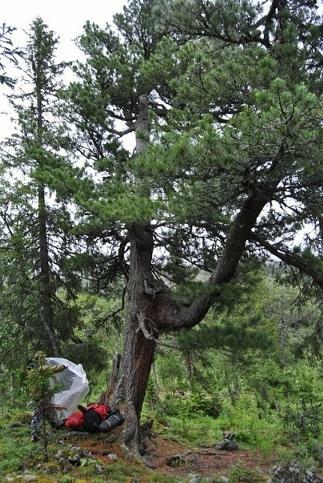 ?distribution of the Siberian cedar begins from the Northern Urals and extends across Siberia to the Far East. In the European part of the cedar pine is not. 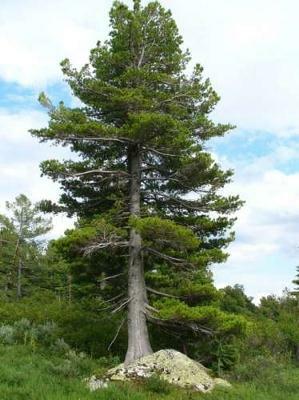 Vegetation period, the cedar is very short, only 40-45 days a year. All the rest of the cedar is in a state of hibernation. From here and such great ages of the trees. 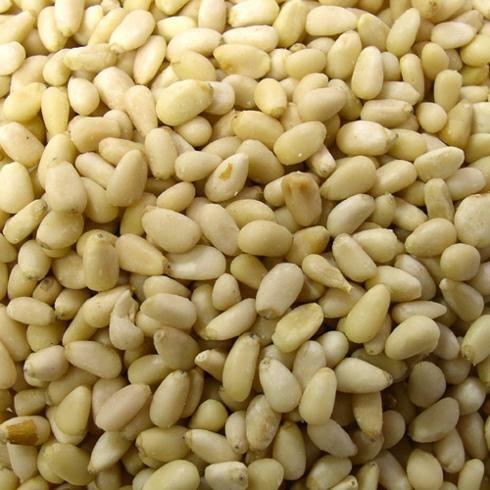 Pine Nuts - a storehouse of nutrients. The core contains pine nut 55-66% fat, 13,5-20% protein, starch, sugar and vitamins. The nuclei of cedar nuts are rich in vitamin B, vitamin E (as alpha-tocopherol) and K, as well as iron, phosphorus, zinc, magnesium, copper and especially manganese. They are high in fat, like all nuts. The core of cedar is used in food and raw materials used for oil of cedar. Also includes copper, manganese, silicon, vanadium, molybdenum, nickel, iodine, tin, boron, barium, titanium, silver, aluminum, cobalt, sodium yo-Dida. The shell cedar nut is a component for some balsams and tinctures. Infusion shell cedar nuts has astringent, analgesic, anti-inflammatory effect. In folk medicine, an infusion of cedar nut shells drink from deafness, hemorrhoids, the neuroses, diseases of the kidneys (eg kidney stones), liver, externally used as a means of depilation. The shell contains tannins, sugars, amino acids and trace elements. 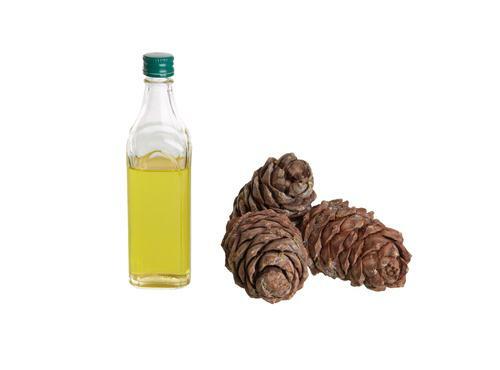 Cedar oil is obtained by two methods: extraction and pressing. 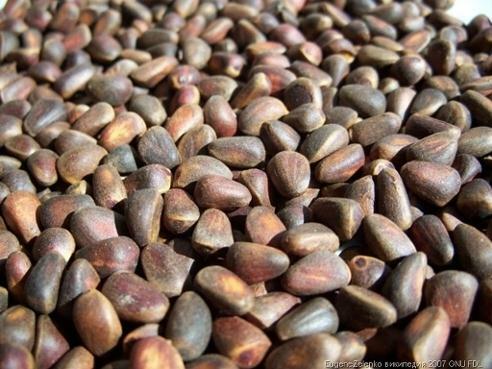 The oil contains many substances: vitamins A, B1, B2, B3 (PP), B6, D, E, F. Used in the treatment of various diseases. In laryngitis, acute respiratory infections, flu, colds, psoriasis and other skin diseases, the treatment of various gastro-intestinal ulcers and a positive effect in various allergic disorders. Besides the oil has a bracing effect, helps to eliminate chronic fatigue syndrome, increases physical and mental abilities. Cedar needles as well as its other side is a drug. In folk medicine uses teas and extracts it. In addition to the vitamins it is rich in tannins, alkaloids, terpenes. Infusions, decoctions as a diuretic drink needles. 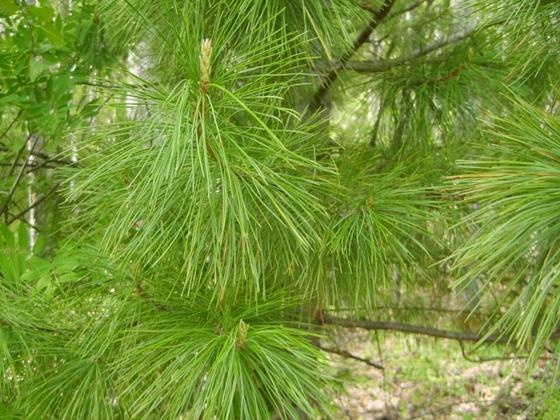 Needles of cedar in the form of decoctions, infusions of Russian folk medicine uses in bronchial asthma as an asthma remedy. Decoction of cedar needles - a great way to rinse the throat with tonsillitis, mouth with stomatitis and nasal passages with a cold. 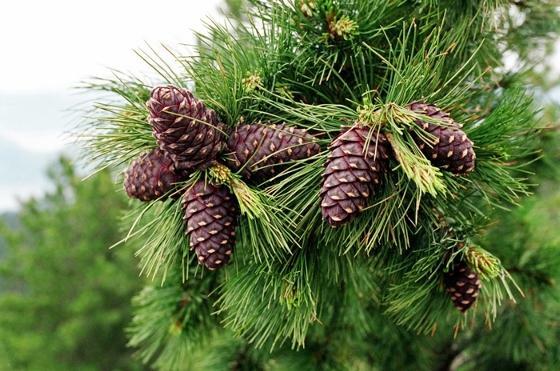 From the cedar needles are an essential oil, chlorophyll, vitamin concentrates, produce vitamin flour, which is rich in volatile production, vitamins C, E, carotene, trace elements (copper, cobalt, iron, manganese, phosphorus). In the fresh needles contained more than 300 mg of vitamin C. The maximum content of ascorbic acid in the needles is during winter. If ohvoennye branch store in the snow, then in 2-3 months, the vitamin C in them is not reduced. But in a heated room (or summer) C-vitamin activity of the needles decreased to 42% of the original within 8-10 days. What to do on a desert island? Why I decided to live in nature? Why I want to live in the wild?